It is often the case when you are talking about grapes that you are actually talking about families of grapes that are all very closely related. Sometimes all of the individual variants are grouped together under a single grape heading and the differences are chalked up to clonal variation. 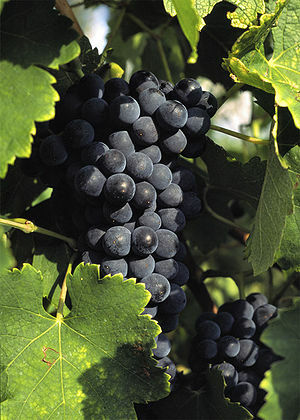 Sangiovese is a good example of this kind of grape. 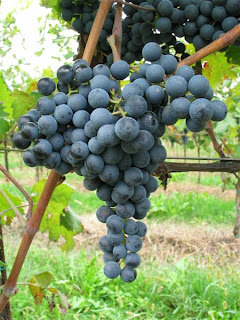 There are a large number of different "strains" of Sangiovese grown, but virtually everywhere you go, people consider the grape to be Sangiovese, even though the wines made from the grapes can be very different from one another. One only has to think of the difference between the wines of Chianti and of Brunello di Montalcino to see the effect that clonal variation and selection can have. Pinot Noir is another good example, but we have made allowances for a few Pinot variants to be recognized as individual grapes. 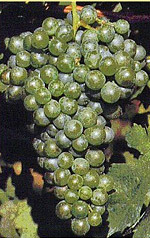 Pinot Blanc, Pinot Gris and Pinot Meunier are known to be mutations of Pinot Noir (as all clonal variants are), but are considered distinctive enough to warrant consideration on their own. What's never been clear to me, and isn't fully clear even now, is when exactly a clonal variant or mutation is significant enough to consider the new grape on its own. Skin color is obviously a major factor, and we have no problem accepting that Pinot Gris, Pinot Blanc and Pinot Noir are different enough from one another that we should consider them separately and on their own merits, even though most modern genetic marker testing for grapes would be unable to tell that the three grapes are different at all. In other words, if you ran the genetic testing that is done to test for grape parentage on those three grapes, the test would come back that all three were in fact the very same grape. This says more about the limits of modern genetic testing than it says about the similarities between the grapes, but it has always struck me as interesting. The issue gets really tricky when you start to look at very old grapes and the families that have sprung up around them. Some grapes mutate more quickly than others, but virtually all of them do mutate and when you look at those grapes over a long enough period of time and over a fairly large geographical distribution, you inevitably end up with some confusion. With these grapes, the geographic dispersal seems to be one major key. What it seems like may have happened is that as the grapes spread out geographically, the local growers began to select clonal variants that were more appropriate for their terroir (or, perhaps that just sold better in that particular region) and these variants spawned their own variants until, over time, you end up with enough genetic diversity to merit consideration as individual grapes, but these grapes are still closely related enough that they can fall under the same family banner. Consider the Muscat grape, for example. The Wine Century Club, while not an official mediator of these kinds of disputes, is interesting in that they accept three different white Muscat grapes as distinct and eligible for reaching 100, though Sangiovese and Brunello are not listed separately and, one assumes, would not be counted twice if one were to write Brunello in. The Malvasia "family" is similar in many ways to the Muscat "family." Both are extremely old and are grown in many different wine regions, though members both can be traced back with relative certainty to Greece. There are two competing theories for Malvasia's origin. The first is that the grape's name comes from the Monemvasia fortress off the Peloponnese coast that was controlled by Venice through the Middle Ages (there is a grape known as monemvasia in Greece today which is apparently unrelated to Malvasia). The Venetians were heavy traders of wine and became so heavily involved in the Malvasia game that their shops in Venice were known as malvasie. The other theory maintains that the grape's name comes from the district of Malevizi on the island of Crete. Whatever the case, Malvasia spread through the ancient world and has retained an impressive presence today. While many of the grapes that have the name Malvasia are related to one another in some way, many of them are not related at all, so to speak of a Malvasia "family" isn't entirely accurate. Malvasia is more of naming group and it isn't altogether clear how or why many of the grapes called Malvasia got tagged with that particular name. Most Malvasia grapes are white, but there are a handful of red ones as well. The most common variety, and the one this wine is mostly likely made from, is called Malvasia Nera di Brindisi. It is grown in a few regions in Italy, though it is most often used as a blending grape as the wines produced from the grape tend to be deeply colored, powerfully aromatic and softly textured. It was once a major blending grape in Tuscany, but is being supplanted there by Cabernet Sauvignon more and more these days. It is perhaps easiest to find in the Negroamaro based wines of Puglia in southern Italy (especially Salice Salento, where it typically comprises 10-15% of the blend), and in fact, Negroamaro is one of the parents of Malvasia Nera (the other is Malvasia Bianca Lunga, which is the most common white-skinned variety of Malvasia in Tuscany). There are two DOC zones within Italy (both in Piemonte) that allow for varietal bottlings of Malvasia Nera, but the total area covered by these zones is less than 100 hectares, and the specific variety of Malvasia Nera is different there (Malvasia di Casorzo is used in the Casorzo region of Piemonte while Malvasia Nera Lunga is primarily used in Asti). The grape is also apparently grown to some extent in Umbria, as I was able to find a bottle of the 2008 I Girasoli di Sant'Andrea Malvasia Nera for about $15 from Bauer Wine and Spirits in Boston. The wine was bottled as an IGT since there is no DOC zone that allows 100% Malvasia Nera within Umbria. In the glass, this wine was a medium purple ruby color. The nose was fairly aromatic with candied red cherry fruit, chocolate and flowers. It smelled a bit like chocolate covered dried cherries. On the palate the wine was on the fuller side of medium with medium acidity and medium tannins. There were flavors of cocoa and espresso with a touch of dried cherry and black fruit, but on the whole, there was very little fruit to this wine. It was dominated by bitter, earthy chocolate and coffee flavors with a sawdust or pencil shavings character to it as well. The wine tasted lean and austere, despite the fairly weighty body on it, since there was virtually no fruit to fill it out. It's hard for me to imagine the kind of person who would take pleasure in a wine like this, to be perfectly honest. You'd probably be better off throwing a shot of Bailey's in your hot cocoa if you're in the mood for those kinds of flavors with an alcoholic kick to them. For a further discussion on grape families and the distinction between clones and individual varieties, see my Roter Traminer post published the day after I wrote this piece. I'm currently on vacation for the Thanksgiving holiday, but while visiting my in-laws in Pittsburgh, I came across this wine that I just had to pick up and write about. I have a few other wines from the Vinho Verde region back home that I'll be writing about in the near future, but this wine was made completely from Espadeiro grapes, which was completely new to me, and I decided to do something I've never done before: I'll be writing today's post while I'm drinking the wine in question. I usually record my notes in a little book I have and have written about some wines up to several months after I actually drank them, but since these Vinho Verde wines are best enjoyed fresh, I thought it would be interesting to write about it while it was fresh in my mind as well. Espadeiro is not just one grape, but rather a small family of grapes that are all, as far as I know, related to one another. The two main varieties are Espadeira Tinto and Espadeira Mole, which I'm guessing are distinguished based on the color of the grape skins, though I'm not completely sure. There are some sources that will have you believe that Espadeiro is the same as the Port grape Tinta Amarela, but this is only true for what is called Espadeiro in the area around Lisbon. 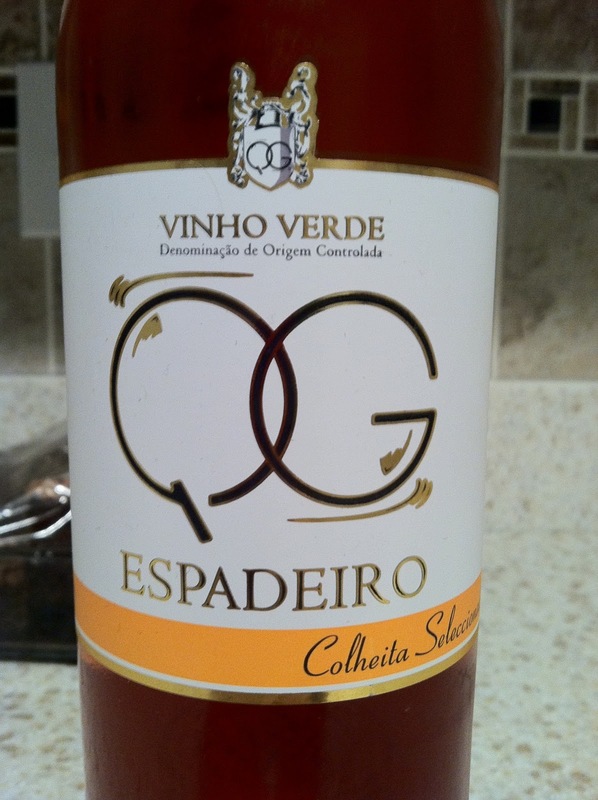 In the Vinho Verde region, Espadeiro is a distinct variety that is unrelated to Tinta Amarela. There are a handful of synonyms for the grape, but most of them seem to be very geographically specific and don't really concern us here. The grape is considered a high quality variety on the Vinho Verde website, though the Oxford Companion to wine is slightly less enthusiastic about and really only references the grapes ability to yield profusely and ripen to low sugar levels. This wine is from the Vinho Verde region of Portugal which is located in the extreme northern part of the country, just under the overhanging Spanish region of Galicia (Espadeira is also grown in Galicia, and surprisingly goes by the same name in both countries). It's easy to forget that Vinho Verde is the name of a wine region and not just the name of a style of wine, as most of the wines here are white and made from slightly underripe grapes with a hint of residual CO2, which can give them the "green" character alluded to in the name of the region and wine. There is a proportion of still red wine and rosé wine produced in the region, though they are definitely a little tougher to track down than their white counterparts. Vinho Verde is subdivided into nine different sub-regions, and Espadeiro is recommended for cultivation in eight of them, with Monção being the only exception. I picked up a bottle of the 2010 Quinta de Gomariz Espadeira Colheita Seleccionada from one of the state stores here around Pittsburgh, PA, for about $10. As mentioned above, in an unusual move for the site, I've been writing about the wine as I've been drinking it. For those interested in the micro-terroirs of the Vinho Verde region, this wine is from the Ave region and the grapes are grown on primarily granitic soils. In the glass, the wine has a medium salmon pink color with a little bit of orange to it and some very tiny bubbles flying around. The nose is very aromatic with strawberry and watermelon fruits and a leesy, cheesy kind of funk to it. Right out the bottle, there were orange citrus aromas and flavors, but as the wine sat and developed into glass number two, these orange citrus notes moved over towards pink grapefruit and have stayed pretty firmly put. On the palate, the wine is medium bodied with acidity just slightly on the higher side of medium and is just off-dry (there is nearly 8 g/l of residual sugar, but the wine tastes much more dry than sweet). There is a prickle of residual CO2 as well. There are flavors of strawberry and grapefruit citrus with a sort of tropical fruit component to it that tastes a bit like pineapple to me. There's a bitter grapefruit pith flavor that persists through the finish. Overall, I like this quite a bit. It's developing in interesting ways right in front of me and has enough going on to keep me interested. It's also delicious and is the kind of thing I wish I had found when I was down here in June rather than now in November. The price here is phenomenal and this wine way over-delivers at the $10 price point. It also would have been a good starter wine for our Thanksgiving meal a few days ago, but I don't like to force others to go on these vinous expeditions with me, so I held this bottle back for myself. UPDATE - I recently wrote about another Vinho Verde wine made from a grape called Padeiro, and in that post, I take another look at the Espadeiro grape and clear up some confusions. That post can be read here. Today we head back into Austria to take a look at the St. Laurent grape. Like seemingly every grape that we take a look at here, St. Laurent's past is somewhat murky and a little controversial, though recent research has helped to shed some light on certain parts of its parentage and history. The biggest question for St. Laurent has always been trying to figure out just what its relationship is to Pinot Noir. One of the accepted synonyms for St. Laurent is Pinot St. Laurent, which naturally led some people to conclude that the two grapes were related. Some people believed that St. Laurent was actually a seedling of Pinot Noir, meaning that both parents are Pinot Noir and that St. Laurent was grown from a seed within a Pinot Noir grape. Other sources, most notably the inimitable French ampelographer Pierre Galet, believed that St. Laurent was completely unrelated to Pinot Noir and was some bizarre import from Alsace. Genetic testing was done and in a paper published in 2000 in the American Journal of Enology and Viticulture, the researchers concluded that it was very likely that St. Laurent is actually a crossing between Pinot Noir and some other unidentified vine. Like its parent, St. Laurent mutates very easily, so the fact that the researchers were able to pin down a relationship between two very unstable DNA sets is pretty amazing, especially considering that some sources believe that St. Laurent has existed for nearly 400 years, which is a lot of time for mutations to happen. Galet did have part of the story right, though, as he surmised that the grape came into Germany and Austria via Alsace. The evidence seems to bear this out, as there are references to the St. Laurent grape in southern Alsace dating back to 1850, and the grape's entry into Germany can be traced precisely to 1870 when a German grower purchased some St. Laurent vines from a viticulturist in Alsace. Some sources presume that the grape is named St. Laurent for the town of the same name near Bordeaux, but since there isn't really any Pinot Noir or Pinot offspring grown in the region, that explanation doesn't make a lot of sense. It is more likely that the grape is named for St. Laurentius Day on August 10, which is approximately when the grapes go through veraison. This is significant because it is between 10 and 12 days sooner than Pinot Noir goes through the same process, meaning that St. Laurent ripens sooner than Pinot Noir and is thus more suited to cooler regions with shorter growing seasons, like Germany and parts of Austria. St. Laurent isn't grown in enormous quantities anywhere, but it has found a home in a few different places. The vine covers about 600 hectares of land in Germany with the best examples coming from the Pfalz region. In Austria, which is perhaps St. Laurent's best known area of cultivation, the vine covers about 800 hectares of land. Perhaps more importantly for Austria, though, is that St. Laurent is one of the parents of Zweigelt, Austria's signature red grape (the other parent is Blaufränkish). Interestingly, St. Laurent is the most widely grown red grape in the Czech Republic, covering almost 10% of their total vineyard area (just over 1700 hectares in total). There are smaller plantings in New Zealand and Canada as well. The grape is finicky in the vineyard, as it buds very early making early spring frosts especially dangerous, and is susceptible to coulure (poor berry set) and rot (despite the grapes' thick skins, the bunches are very compact and moisture that gets into the bunch has a hard time getting back out, leading to rot). I was able to pick up a bottle of the 2008 Zantho St. Laurent from my friends at Curtis Liquors for about $15. In the glass, the wine was a deep purple ruby color that was nearly opaque at the core with a narrow crimson rim. The nose was nicely aromatic with savory, meaty aromas, sweaty leather, Asian spice and plummy fruit. On the palate, the wine was on the fuller side of medium with fairly high acidity and low tannins. There were earthy meat and wet leather flavors with black plum and stewed cherry fruit. There were also notes of Asian spice and black pepper. As the wine opens up, the meaty, savory aromas dissipate a bit and the fruit flavors step more into the forefront and the fruit character shifts to more towards the cherry end of the spectrum. Therry Theise, in one of his wine catalogs, describes St. Laurent as "Pinot Noir with a 'sauvage' touch," and John Schriener writes that "it comes across as a Pinot Noir wearing hiking boots," both of which pretty much sum up my feeling on the wine as well. I had actually written in my notes that the wine was like a brooding, meaty Pinot Noir but denser and darker. For fans of gamier, meatier Pinot Noirs, St. Laurent is a can't miss, especially considering the price that most of them sell for. 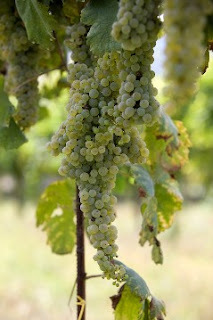 Last week we took a look at the Bombino Bianco grape and noted that one of its synonyms was Pagadebit, or "debt-payer." In that post, I alluded to a grape grown in the Emilia-Romagna region of Italy that is also known as Pagadebit and is thought to be the same as Bombino Bianco. It turns out that most of what is known as Pagadebit in Emilia-Romagna may actually be Bombino, but some of it is actually a rarer, much less well-known grape called Mostosa, which is what we'll be taking a look at today. Figuring out exactly what Mostosa is isn't an easy task. Most sources, if they mention the grape at all, only mention that it is a rare white grape used primarily for blending in the Lazio and southern Emilia-Romagna regions of Italy. Some sources also indicate that Mostosa may be the same as the Biancone grape, and it is here, in the area of accepted synonyms for the grape, that the trouble really starts. All grapes that are grown anywhere in the world have several different names that they are known by, generally as a result of their movement through different regions (Chasselas, for example, has over 200 synonyms). Before the days of the internet and the world-wide wine scene, grape growers from different regions weren't necessarily in very close contact with one another, so as new grapes arrived and settled in, they tended to pick up names from the local dialect or they picked up colorful descriptive names that the local farmers may have just liked more than whatever the grape had been called when it first arrived. In Europe especially, the names of the grapes weren't that important because the wines were (and for the most part still are) labeled geographically and not varietally, so as long as a vine grew well and made decent wine, it wasn't really all that important what you called it or, to some extent, even what it was. In many countries, Appellation Control laws have changed that by specifying the specific grape types that can be grown in a given region, but remember that these laws are less than 100 years old, while the history of grape growing and wine making goes back thousands of years. It is also important to note that since there was no centralized place for information about what a vine actually was, mistakes were often made either by growers or people selling vines either due to mislabeling or misidentification both of the accidental and of the malicious sort. When vines are very young, they all look pretty much the same. Even when they grow up, it takes a skilled eye to differentiate between the thousands of different grape types, and mistakes often happened. There is the famous story about how most of what was grown in Chile and called Merlot actually turned out to be Carmenere. As information about grapes becomes more centralized, and as genetic testing becomes more sophisticated and accessible, it is becoming easier to correct these mistakes and to figure out exactly what is going on in many of these vineyards. With today's grape, I suspect that the issue is more with the local naming of grapes than with a case of pure mistaken identity from mislabeled vines. In my opinion, it is the colloquial "Pagadebit" name that is the source of all of the confusion. According to the VIVC, there are four different Italian grapes that have Pagadebit (or some variation) as an accepted synonym (and one Croatian grape, Plavac Mali). Those four grapes are Pagadebito, Bombino Bianco, Mostosa and Biancone. Of those four, Biancone is an accepted synonym for Mostosa, but not the other way around, while Pagadebito has both Mostosa and Biancone as accepted synonyms. Bombino fits in because it has Pagadebit as an accepted synonym, but is not itself an accepted synonym for any of the other three grapes. All four of the grapes mentioned above have their own VIVC variety numbers, which I believe means that they are distinct cultivars (parent information is only available for Pagadebito and Mostosa, which have different parents and are thus clearly different grapes). Further, Nicolas Belfrage, in his Brunello to Zibibbo, quotes Salvatore del Gaudio and Domenico Giusto's Principali Vitigni as saying: "the descriptions of Trebbiano Abruzzese, of Caccio (another name for Mostosa), and of Pagadebito (almost certainly Bombino Bianco in this context)...differentiate themselves from one another in several respects, so that in the last analysis it seems possible definitely to state that the three are different varieties." There is no mention of Biancone in this analysis, so it's hard to say what their opinion of its relation to Mostosa is. It is worth mentioning, though, that in their Wine Grape Varieties, George Kerridge and A.J. Antcliff note that Biancone is native to Corsica, indicating that it probably isn't related to any of the grapes mentioned above. Further, they note that it is the highest yielding vine currently planted in Australia, clearly showing how it earned its "Pagadebiti" nickname in Corsica. What I think may have happened is that the Pagadebit name was attached to one of the grapes and then was either picked up by other growers in other regions who decided that the name was an apt descriptor of grapes they were growing. It is certainly possible that the growers in each different region came up with the name independently of one another, but it seems unlikely. I imagine that a grower traveling into a different region may have heard the locals refer to one of their grapes with that name and thought to himself, "I have a vine just like that back home," and may have started referring to his own crop with that name. Over time, the name got entrenched and when people scan the vinous landscape today, they want to believe that grapes that share synonyms are related in some way, possibly even identical. I don't believe that these grapes are related any more than I believe that all people with the last name Smith are related, though I would be very interested to see someone do the DNA analysis to see what the story really is. All of that colloquialism is well and good, but we live in an official world and when we are dealing with wine that crosses international borders, some arm of officialdom inevitably steps in. My journey down this road began when I picked up a bottle of the 2010 Trere Pagadebit di Romagna frizzante from my friends at the Wine Bottega for about $12. The wine is from the Pagadebit di Romagna DOC, which requires a minimum of 85% Bombino Bianco. The back label on the bottle, however, indicated that this wine is made from 85% Mostosa and 15% Chardonnay grapes. I emailed the winery to ask whether Mostosa and Bombino were the same grape or, if not, how they were able to bottle a DOC wine from Mostosa grapes, but received no response. Their website also clearly indicates that Mostosa is the primary grape here, as does the Wine Bottega's site, and the research that I've done seems to indicate that Bombino and Mostosa are definitely two distinct grapes. I'm not sure what's going on with all the official stuff, but it's really between Trere and the Italian government, I suppose. In the glass, this wine was a pale greenish silvery lemon color with a little fizz to it. The nose was nicely aromatic with candied green apple (or sour apple candy or something like that) and a touch of flowers. On the palate the wine was on the lighter side of medium with medium acidity and a light, fizzy texture. It was somewhere between dry and off-dry with flavors of candied green apple, a touch of apricot/stone fruit and just a little bit of toastiness. There was also a distinctive apple peel character that almost verged on cider. Overall, the wine was light and fruit and very similar to Prosecco, though a little less bubbly and slightly more complex. It's a fun little wine that's very enjoyable for the money and is probably best on its own or with light snacks. Today's grape has one of my very favorite grape names of all time. 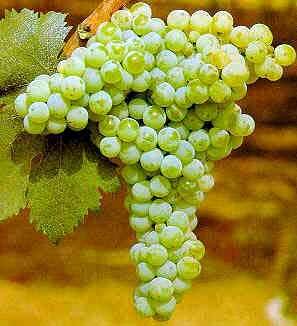 Bombino Bianco is so fun to say and makes me picture these little white bombs growing on grapevines. Sadly (for me anyway) the name has nothing to do with bombs, but exactly where it comes from isn't totally clear. One story has it that the grape bunches look a child with its arms outstretched, so the name Bombino comes from the word Bambino, meaning baby. It would take a Herculean effort of imagination to picture a baby with arms outstretched in any of the images for Bombino that I've seen, so I'm extremely dubious about this particular story. There is a slightly more believable story that relies on the grape's purported heritage for its explanatory power. It thought that the grape may have come over from Spain, though no one offers any evidence (ampelographical or genetic) that I can find to support this hypothesis, and I'm not aware of any vine currently planted in Spain that may be Bombino in disguise. In any case, the story goes that the Spanish name for the grape was Bonvino (meaning "good wine"), but since the Spanish "v" is pronounced like the Italian "b," the name got corrupted to Bombino once it took hold in Italy. This story is convincing only to the extent that you buy that the grape is from Spain, and I find myself wondering if perhaps this origin story was concocted because of its linguistic convenience and is itself ultimately the source for the purported Spanish connection. Wherever the name's origins truly lie, the grape is today known as Bombino Bianco, except when it isn't. Bombino has a wide variety of synonyms, and these synonyms get us into trouble as we move from region to region within Italy. 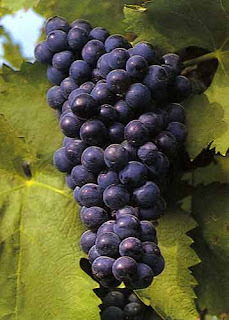 The grape is known as Pagadebit or Pagadebito in some places, but this is a relatively common synonym for many different grape. The name means "debt-payer" and is commonly used for several grapes that give very high yields and produce a lot of juice for the grower. In particular, there is a grape in Emilia-Romagna known as Pagadebit that was (and, for the most part still is) thought to be the same as Bombino, and a lot of it may be Bombino, but at least some of it is another grape altogether (see my post on Mostosa for info on this grape and on the Pagadebit name more generally). Some sources also indicate that Bombino and Trebbiano d'Abruzzo are one and the same grape, though this also may turn out to be untrue. 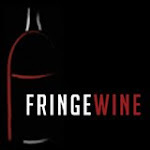 While Wikipedia lists Trebbiano d'Abruzzo as an accepted synonym for Bombino Bianco, The Oxford Companion to wine indicates that they are distinct grapes, and Nicolas Belfrage, in his Brunello to Zibibbo concurs. Belfrage quotes two Italian writers, Salvatore del Gaudio and Domenico Giusto, who, in their Principali Vitigni, examined the ampelographical characteristics of the two vines and concluded unequivocally that the two grapes are distinct. So our current situation is essentially this: we find ourselves in Puglia with a grape called Bombino Bianco, which is sometimes called Pagadebit, but which is different from the Pagadebit in Emilia-Romagna, or is at least different from some of the grapes called Pagadebit there, and which was also thought to be identical to Trebbiano d'Abruzzo, but is not. Our Bombino is, as the Pagadebit synonym (and the more colorful Stracchia Cambiale synonym, meaning "tear up the invoices") suggests, a cash crop, grown primarily because it yields explosively and reliably. Few producers bother with bottling the wine, and a great deal of it is shipped to Germany, where it is bottled as ordinary, anonymous EU Table Wine. Nicolas Belfrage's assessment of the potential quality of the grape is summed up when he says "Bombino Bianco can make as dull and tasteless a wine as you could hope to find." He mentions that some producers are experimenting with lower yields in an effort to coax some character from the grape, but ultimately says the wines produced even from these estates are "more for the drinker than the thinker." Despite that lackluster endorsement, I picked up a bottle of the 2009 Cantele "Telero" Bombino Bianco from my friends at Curtis Liquors for about $8. In the glass, the wine was a pale silvery greenish lemon color. The nose was moderately aromatic with crisp apple, pear, and grapefruit peel aromas. On the palate, the wine was medium bodied with medium acidity. There were flavors of pear and lemon with a grapefruit/lemon citrus peel sort of thing lurking in the background. There was something vaguely floral about it, but it wasn't really strong enough to pin down to anything more specific than that. It finished with a chalky kind of minerality that I wasn't particularly crazy about. Overall, it was pretty generic, though I wouldn't go so far as to say it was the most dull or tasteless wine I've ever had. There's nothing here to offend anyone unless you're offended by mediocrity. I will say that if you open this bottle, finish it the same day as it went sharply downhill on day two and became nearly undrinkable. For people who are fans of inexpensive, mild white wines, there's probably a lot here to enjoy. It could sub in very well for some of the high volume Pinot Grigio or Garganega based wines made in northern Italy so if you just feel like switching it up a little bit geographically, give this a shot. Believe it or not, at one time in history the Abbuoto grape and the wine made from it (Cecubo in Italian, but Caecubum in Latin) were very famous. The Roman poet Horace mentions the wine several times throughout his work, usually as a wine used in grand celebrations, such as Octavius Caesar's victory over Antony and Cleopatra, where Horace described it as "the Caecubum reserved for festal entertainments." The wine was so famous and well thought of that the region where it was produced (today's southern Lazio and northern Campania) was referred to as the Caecuban countryside. That was a very long time ago, though, and seemingly no wine can resist the force of changing tastes and political turmoil. The Romans began to favor lighter wines and the dense, rich Cecubo began to fall out of favor. Our old friend Pliny blames the downfall of Caecubum on Nero. According to Pliny, the grape was grown in the marshy areas near the Gulf of Amyclae. He believes that its eradication was caused by the "carelessness of the cultivator," whatever that means, and by the building of a canal from Lake Avernus to Ostia by Emperor Nero. The only canal that I can find any evidence that Nero had anything to do with was the Corinth Canal, which was in Greece, so one wonders about the veracity of Pliny's account here. In fact, it seems as though the Roman General Agrippa actually built the canal a few decades before Nero came to power. Many Roman writers were overtly antagonistic to Nero in their texts, so it's totally possible that Pliny is just piling on him at this point. What actually happened is probably something much more mundane than a mad Emperor tearing up vines to search for buried treasure. The fact of the matter is that there are many wines mentioned in Latin texts that have, for one reason or another, disappeared completely for no one reason, and it is likely that time simply took its toll on the famous Caecubum wine and the Abbuoto grape and they slowly faded away. And they were thought to have been lost forever to history until a few decades ago. The story (in Italian) goes that, in some of the marshy areas around Lake Fondi about 50 miles south of Rome (where the original Caecuban countryside is purported to be), there were some old, neglected vines of a type that was thought to be the ancient Abbuoto. Cuttings were taken from these vines and nursed back to health. The healthy vines were definitely different from any other variety currently known, and the claim that they are the same as the ancient Abbuoto has remained unchallenged. It's certainly possible that it is the same ancient vine, but there's no real way to prove it. The vines.org encyclopedia indicates that there is between 700 and 800 hectares of land devoted to the Abbuoto grape throughout Italy (most of it centered in Lombardy and Piedmont, oddly enough), which seems like it doesn't match up with the recent "re-discovery" of the grape all that well, especially given that the grape seems to be grown in 12 different regions of Italy. I'm skeptical of the re-discovery story as it is presented, as it reeks of a marketing ploy to me, but I tend to be overly cynical about these kinds of things and invite you to draw your own conclusions. Whatever the case may be, it is an undeniable fact that wines containing the Abbuoto grape are not exactly common. One of my local grocery stores has a full service liquor store on premise that I was wandering through one day when I came across the Villa Matilde "Cecubo" bottling for about $10. The amazing thing about it was that the only vintage available in the store was from 1999, so it must have sat on those shelves for nearly a decade before I came across it. Abbuoto is typically a blending grape, and this wine is no exception, containing 45% Abbuoto, 35% Primitivo and 20% Piedirosso. In the glass, this wine was a fairly deep ruby color and was going garnet at the edges. The nose was nicely aromatic with prune, fig, baking spice and leather. It was very earthy and appealing. On the palate, the wine was on the fuller side of medium with high acid and fine, dusty tannins. There were spicy black cherry, black plum and prune fruits with a savory leather and dusty earth character to it. There was also a pronounced cola flavor that was interesting, if a little odd. Overall, I enjoyed the wine quite a bit. It's difficult to find a 12 year old red wine for around $10, and luckily this wine had aged gracefully. I'd be very interested to try this in a more recent vintage, but as noted above, it's not easy to find. I believe there are some producers making wines with a higher percentage of Abbuoto in them, but good luck finding them. It seems like every time you turn around in Italy, there's an interesting grape with a complicated back story. Today's grape is no different, though the complications surrounding it are much easier to sort through than some of the others we've dealt with here. The grape in question is Verduzzo, and having said that, we're immediately in trouble. It turns out that there are two grapes called Verduzzo which are not related to one another at all. There's Verduzzo Trevigiano, a high yielding vine that is thought to have originated in Sardinia. It's not generally well thought of, as the following quote from Nicolas Belfrage in his Barolo to Valpolicella indicates: "a variety of little character whose main virtue resides in the fact that it churns out regularly impressive volumes of plonk." 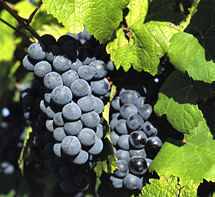 The grape is also known as Verduzzo Dorato and is mostly grown in the Lison Pramaggiore and Piave DOCs in the Veneto. And then there's Verduzzo Friulano, which is also grown in the Veneto but which seems to be native to Friuli. We're not completely out of the woods yet, though, as there are also a few sub-varieties of Verduzzo Friulano. 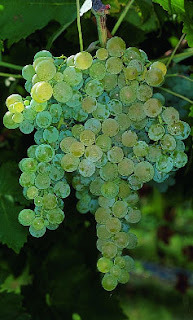 Verduzzo Verde and Verduzzo Giallo are the two most common within Friuli. The Verde subvariety (so named because of the greenish color of the berries) is the lesser of the two, while the Giallo (so named for the yellowish color of the berries) is the more highly esteemed. The final member of the Verduzzo Friulano family is known as Verduzzo Rascie and it is differentiated from the others by its loose berry clusters which make it ideal for late harvest sweet wine production (the space between the berries allows air to circulate and reduces the chances that the grapes will develop rot or fungal diseases). Verduzzo Rascie is grown almost exclusively in the Ramandolo DOCG within Friuli. On the whole, the sweet wines made from late harvested Verduzzo grapes are held in higher esteem than the dry table wines, but since a dry table wine is all I've been able to find, that's what we'll be taking a look at today. The winery who makes the bottle I was able to find is called I Clivi and they have 4 hectares of land in the Collio DOC and 8 hectares in the Colli Orientali del Friuli DOC areas of Friuli. They bottled their first wine in 1996, but the vines that they tend are much older than that, averaging between 40 and 60 years old. They bottle two "flagship" white wines called Brazan (from their Collio vineyards) and Galea (from their Colli Orientali del Friuli vineyards) which, until a few years ago, were blends of the local Tocai Friulano grape and Verduzzo (with some Malvasia). They decided to pull the Verduzzo and Malvasia out of these wines and make them both 100% Tocai Friulano. They also decided to bottle the Verduzzo as a varietal wine, naming it Bianco Degli Arzillari. The estate farms organically and the yields are very small, at a scant 2-3 tons per hectare. The white wines are fermented in temperature controlled stainless steel only using natural yeasts. If malolactic fermentation happens, it happens, and if not, it doesn't. I found my bottle of the 2007 Bianco Degli Arzillari at Curtis Liquors for about $13. The 2007 was the most recent vintage available on the market, as the wines are aged sur lie for two years before bottling and are then aged in bottle for a few months after that. The wines are released when they are at least three years old. You may notice that this wine is bottled as an IGT and not as a DOC wine. It is legal to make a 100% Verduzzo wine in either Collio or Colli Orientali del Friuli, but since the grapes come from both of those regions, then it can't be labeled as either. In the glass, the wine was a medium lemon gold color. The nose was reserved with some pear, lemon peel, white flowers and a noticeable leesy kind of aroma (which, to me, is a kind cheesy or slightly funky smell). On the palate the wine was just slightly on the fuller side of medium with acidity just on the lower side of medium. There were flavors of white pear, ripe apple and apple skin with a clean, stony minerality on the finish. The flavor profile was pretty neutral overall, though it picked up a little bit of that leesy funk as it approached room temperature. It's well balanced and well made, but it's not the kind of white wine that gets me really excited, I guess. It's certainly a very nice wine for the price, but when I try to think about the kinds of occasions where I'd reach for this wine, I come up blank. Buckle up friends and neighbors, because we're about to go on a wild ride through Roman literature, religious symbolism, volcanoes, fuzzy little animals and of course, a grape and some wine. What we're talking about today is the grape Coda di Volpe, which means "tail of the fox." 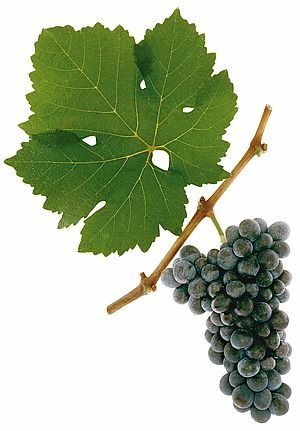 The story goes that the grape is so named because the clusters have a slight curve to them that resembles a fox's tail, which you can kind of see in the picture to the left at the very bottom of the bunch. I started to look into who actually gave it that name, and ended up going on the journey you see below. The source of the name Coda di Volpe is purported to be Pliny the Elder. Pliny wrote a massive 37 volume work entitled The Natural History which has an entire volume (volume 14) devoted to matters of the vine. Within Volume 14, there are 29 chapters dealing with various subjects related to grapes and vines, but it is chapter 4, entitled "Ninety-One Varieties of the Vine" where the mention of Coda di Volpe happens. I found an online translation of the work (translated by John Bostock and H.T. Riley in 1855) that translated the relevant block of Latin text as "the produce of the alopecis, which resembles in colour a fox's tail." 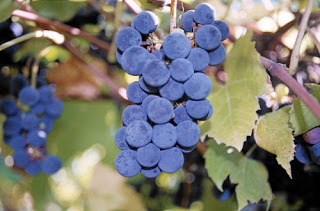 Nearly every secondary source I've read about the grape maintains that the name comes from the shape of the bunch, so I was very curious to see that, in what appears to be the first mention of the grape in print, it is not the shape that is credited as being the source of the name, but rather the color. The annotation maintains that this "Alopecis," or "fox-vine" is a currently unknown variety, but Nicolas Belfrage, in his Brunello to Zibibbo and Bastianich and Lynch in their Vino Italiano seem fairly convinced that this reference is in fact to Coda di Volpe. Their certainty seems to stem directly from the Latin text, where the phrase rendered in English as "fox's tail" is, in the original Latin, the phrase "caudas vulpium." It doesn't take a great deal of imagination to see how we got from "caudas vulpium" to Coda di Volpe. This is the only occurrence in the entire Natural History of the phrase "caudas vulpium" and it is the only appearance in any work of the word "Alopecis," so if we believe that Alopecis is the ancient name for Coda di Volpe and that the modern name comes from the Latin phrase "caudas vulpium," it's hard to say that the grapes are named for the shape of the bunch when the source material makes the link based on the color of the grapes. What is really interesting, though, is if you look at the passage in the original Latin on the same website, it allows you to click on individual words to get a translation. Clicking on "Alopecis" brings up the following definition: "a kind of vine which produces clusters resembling the tail of a fox." The main problem here, I think, is due to the ambiguity of the original Latin text. The full sentence in Latin is: "contra damnantur etiam visu cinerea et rabuscula et asinusca, minus tamen caudas vulpium imitata alopecis." My Latin is a little rusty, but I don't see any reference in that phrase either to the color or the shape of the Alopecis. The end of the sentence reads to me something like "the Alopecis, which resembles a fox tail." The ambiguity and confusion seems to stem from trying to interpret the way in which the Alopecis resembles a fox-tail, because there is no explicit aspect of a fox-tail that the Alopecis is being said to resemble. The context of the sentence as a whole is centered around colors ("cinerea" is ash-colored, "rabuscula" is russet-colored and "asinusca" means something like donkey-colored), so reading the text in that light certainly makes the translation quoted above make more sense. We're making a comparison between all of these objects and color is what groups the first three together. It would be odd to suddenly shift to a different kind of feature (such as shape) for the final item in the comparison. Because of all that, I'm inclined to buy the color argument more than the shape one. It is, of course, possible that the fox-tail shape story developed completely independently of anything else and there is absolutely no connection between Pliny's description of Alopecis and the modern day Coda di Volpe. That feels like it would have to be a pretty big coincidence, so I tend to doubt that's the case. What I suspect may have happened is that along the way, someone who wasn't familiar with Pliny's text was trying to understand for themselves how Coda di Volpe could have possibly gotten its name, and just decided that since it kind of looks like a fox-tail shape, that must be where it came from. The story has reinserted itself into the gloss on some of the texts and, in one case, has inserted itself wholesale directly into a translation. Philemon Holland's 1601 translation renders the passage: "and yet the fox-tailed grape Alopecis (for that it resembleth Rainards taile)." The bit in the parentheses there is not contained in the original Latin text at all and is a full insertion by the translator, indicating either that the shape explanation was relatively wide spread by this time, or indicating that Holland himself may be the source of the confusion. If you've stuck through all that, then you're a real trooper and I appreciate it. Now that we've exhausted ourselves on the history of Coda di Volpe's name, we can take a look at the name of the region where this particular bottling is from, Lachryma Christi del Vesuvio. It turns out that this name is itself not without controversy. The most widely believed origin for the name Lachryma Christi del Vesuvio is that when Jesus was on his way up to Heaven, he looked down at the Bay of Naples and was so moved by its beauty that he wept tears of joy which fell on Mount Vesuvius, causing grapevines to spring up where they landed. Some believe that this is a modernization of an ancient Roman myth about Bacchus weeping and having vines spring up from his tears, but I'm having a hard time finding any source material for that. Another legend has it that when Lucifer was cast out of Heaven, he grabbed a piece of Paradise which fell with him, landing at the foot of Vesuvius, where it framed the Bay of Naples. Jesus wept when he saw the loss and his tears landed on the slopes of Vesuvius, where grapevines sprang up. Yet another story has it that when Lucifer was cast from Heaven, he landed at Vesuvius and began to destroy everything in sight. Jesus wept when he saw the destruction and, you guessed it, his tears landed on the slopes of Vesuvius and grapevines sprang up. Whatever the true origin of the name is, we do know that some deity cried for some reason and those tears were so magical that grapes sprang up where they fell. The modern explanation for how a wine gets the name Lachryma Christi del Vesuvio on its label is much more mundane. There is a Vesuvio DOC that surrounds the ancient volcano and where the white wines must be made up of at least 80% Coda di Volpe and or Verdeca with a 35% minimum of Coda di Volpe and a maximum of 20% Falanghina and/or Greco. As you might imagine, the soils around Vesuvius are volcanic, which happens to be Coda di Volpe's favorite kind of soil to hang out on. The red and rosato wines must be at least 80% Piedirosso and/or Sciascinoso with at least 50% Piedirosso and at most 20% Aglianico. Any producer is entitled to put "Lachryma Christi del Vesuvio" on their label if the wines have a slightly higher alcohol content, a whopping one half-degree above normale. Essentially, the Lachryma Christi prefix to the wine's name is a different way to say Riserva and nothing more. I was able to find a bottle of the 2009 Feudi di San Gregorio Lachryma Christi del Vesuvio from my friends at Bin Ends for about $14. The wine is about 80% Coda di Volpe and 20% Falanghina. The vines that the grapes come from are between 15 and 20 years old and are located directly around Vesuvius. The grapes are hand-sorted and gently pressed prior to undergoing primary fermentation in stainless steel with no malolactic fermentation. The wine is aged in steel on the lees for three months and then aged for one more month in bottle before release. In the glass, the wine was a pale lemon green color. The nose was nicely aromatic with ripe pear, lemon cream and apple. On the palate the wine was on the lighter side of medium with fairly high acid. There were flavors of creamy pear, apple peel, a touch of white peach and a little lemony citrus. The wine was delicate and subtle with a quiet, chalky kind of minerality on the finish. It wasn't a particularly complex wine, but it was fresh and clean tasting. It's a great summertime wine that would be an excellent match with light seafood or chicken dishes. Last week we took a good, long look at the Fer Servadou grape and the regions of Southwest France where it can be found. Fer isn't exactly widespread, but it is definitely grown in a wider variety of regions than its running mate Duras. Duras finds it home almost exclusively in the Gaillac region of Southwest France (just northeast of Toulouse), with only a little grown in the Côtes de Millau just down the Tarn River to the east. And that's it. Duras isn't grown anywhere else in France or in the world, as far as I know. As mentioned in that Fer post, Gaillac is a very old wine region with evidence of vineyards going back to the first century AD, predating planting and production of their illustrious neighbors to the north, Bordeaux, by a few centuries. Barbarian invasions in the Early Middle Ages pretty much shut production down for awhile, but it was revived here, as in many places in Europe, by the church around the 10th Century. The wines achieved some degree of fame during this time, and England in particular was a very enthusiastic market. Gaillac suffered as so many Southwestern French regions did at the hands of the Bordelais who controlled the shipping of wines into and out of the port at Bordeaux. Stiff taxes made the cost of doing business prohibitively high for many, and the region's reputation the global scene suffered as a result. Phylloxera and two world wars have also taken a heavy toll in the more recent past. Which is a shame, because in addition to the wealth of interesting grapes in Gaillac, the region is also blessed with a good climate for grape growing and with many interesting terroirs. The Tarn River runs through the center of the region and many vineyards are planted along its banks on gravelly, pebbly soil with a high clay content and chalk subsoil. As you move away from the river, you move into some of the foothills of the Pyrenees mountains. The slopes get steeper around here and the soil base is mostly sandstone. The most important climactic feature of the region is the vent d'autan wind that blows up from the southeast. It's a dry, hot wind that helps to prevent fungal disease for the vines during the ripening season by blowing off the damp, cool conditions that fungi thrive in (which is an especially nice feature, since Duras is particularly susceptible to several of these fungi). About the Duras grape itself, there isn't much to say. It's unclear where the name of the grape comes from, except to say that it has no connection with either the Côtes de Duras near Bordeaux or the Durasa grape from the Piedmont region of Italy. Duras buds early, which can be a problem in Gaillac as Spring frosts are common enough to be an issue. The only thing known about its family history is that it is one of the parents (along with Petit Verdot) of a nearly extinct Burgundian grape known as Tressot. It is the most widely planted red grape in Gaillac, covering about 1000 hectares of land in 2000, which is about 10% of all plantings in Gaillac. Like Fer, there is a planting requirement for Duras in Gaillac, meaning that for growers within the AOC boundaries, at least 10% of their red vine plantings must be devoted to Duras. Red wine from the Gaillac AOC must contain at least 40% of some combination of Fer and Duras, with Syrah and Gamay generally making up the difference. I was able to pick up a bottle of the 2008 Genouillac "Burgale Rouge" bottling from my friends at Bin Ends for about $10. This wine is 70% Duras, 15% Fer and 15% Syrah. In the glass, the wine had a deep, inky purple-ruby color with a violet rim. The nose was a little shy with some aromas of black cherry and blackberry fruit, but there was also a meaty, black-pepper character to it as well. On the palate the wine was on the fuller side of medium with medium acidity and fairly high tannins. There were stewed black fruit flavors, charcoal, black cherry, blackberry, smoke and a lot of black pepper. The fruit character was a little lean and muddled, but the earthy, smoky, peppery characteristics were there in spades. The whole time I was drinking it I was wishing that I had a nice grilled steak au poivre to eat with it. As it is, if you're a fan of Rhone-style Syrahs that are heavy on the black pepper, this is going to be right up your alley. It's also a great value wine at only $10. It's been a few months since we visited the vinous wonderland is that is Italy's Piedmont region, so today I'd like to head back into those Alpine hills to take a look at a grape called Erbaluce. Erbaluce is one of those grapes that seem to have been around forever. It is first mentioned in print in 1606 in a work by G.B. Croce under the name of Erbalus, though there are some who believe that the grape has been cultivated in northern Piemonte since before the Romans arrived. The Erbalus spelling was used again in a work towards the end of the 18th Century, though that author (Count Nuvalone), mistakenly takes the "Erbalus" to be a synonym of the Arneis grape grown nearby. Other authorities have tried to draw some connection between Erbaluce and Greco, with one 19th Century ampelograher referring to Erbaluce as Greco Bianco from Ghemme (a village in northeastern Piemonte), but a link between the two grapes is unlikely (despite the fact that one of the listed synonyms for Erbaluce is Greco Novarese). Several of Erbaluce's listed synonyms also contain the word Trebbiano, though the grape isn't thought to be related to that family either. Which leaves us practically nowhere in trying to guess at Erbaluce's origins. Most sources state that the grape is native to northern Piemonte and leave it at that. It would appear, given the lack of information, that we currently have no choice other than to do the same. The grape is named for the copper color that the bunches take on as the sun hits them on the vine. The selling point and the criticism of wines made from the grape is their high acidity. High acid is a great thing for the sweet and sparkling wines made in the region, but opinions seem to be divided on whether it's such a good thing for the dry table wines. Production is centered around the town of Caluso, which is about 30 km northeast of Torino. Interestingly, given the grape's long history of cultivation in the area, it has not migrated at all and there are no significant plantings to speak of outside of this small area. The village and the vineyards sit in a glacial basin at the foothills to the Alps, where a modest handful of producers dedicate themselves to the Erbaluce grape. The Erbaluce di Caluso DOC requires 100% Erbaluce grapes, though the style can be dry, sparkling or sweet, with the sweet passito style wines held in the highest regard. I was not, unfortunately, able to find a bottle of passito Erbaluce, but was able to pick up a dry table wine and a fully sparkling spumante version. The first bottle I tried was the "La Rustia" offering from Orsolani. I picked up the 2008 vintage from Central Bottle for about $21. In the glass, the wine had a pale greenish lemon color. The nose was moderately open and fairly straightforward with green apple, pear, and lemon peel aromas. On the palate, the wine was on the lighter side of medium with high acidity. There were racy flavors of green apple, lemon-lime citrus and citrus peel. The wine finished with a kind of grassy, herbaceous note on the back end. The acidity was electrically high, but the wine had enough fruit coating that live wire to make it manageable. I would recommend serving this with a pretty significant chill on it, as the acidity gets a little overwhelming as this approaches room temperature. I love high acid white wines, so this was right up my alley. The second wine I was able to try was the 2006 "La Torraza" bottling from Ferrando. I picked it up for about $40 from my friends at the Wine Bottega. In the glass, the wine was a medium lemon gold color with vigorous, almost aggressive bubbles. The bubbles were frothing so much that when I went to pick up my glass by the stem, the top of my hand got wet from the bubbles bursting and sending spray over the sides of the glass. The nose was fairly reserved with just a bit of yeastiness, but it was mostly just a blank. On the palate the wine was light bodied and bone dry with high acid and very intense bubbles. There was some lemon peel citrus, toast, and a clean minerality, but the overall impression was one of severity. This wine was nearly all structure and little stuffing and my notes are littered with words like lean, sharp, angular and austere. Which is not to say that I found it unenjoyable, it's just to say that the enjoyment that I got from it was not a purely hedonistic experience. The wine was precise and focused and there's something to be said for that. It's not the kind of thing I'd open on New Year's Eve, but it is the kind of thing that has all the characteristics of a nice aperitif and, further, lends itself well to a wide variety of food pairings. Last week we ventured for the first time into the exciting world of Southwest France. Specifically, we took a look at the Fer Servadou grape as it is grown in the Gaillac and Marcillac regions. Today we'll turn our attention to one of the interesting white varieties of Southwest France, Gros Manseng, and one of its most well known homes, Jurançon. Gros Manseng is a member of what's known as the Manseng family of grapes. The Manseng family is similar to the Pinot family or the Traminer family. The family starts out with a single member: in the Pinot family it was Pinot Noir while in the Traminer family it was Traminer itself (also known as Savagnin). The Manseng family's initial member was Manseng Noir, a little used (but still grown in small quantities) grape of Southwest France that is very tannic and deep in color. This single initial member is very genetically unstable and prone to spontaneous and frequent mutation in the field. Many different mutations with different berry colors or other characteristics are then selectively propagated by the grower and you end up a bunch of grapes that are genetically very similar, but which have very different phenotypical characteristics. Thus, from Pinot Noir we get Pinot Blanc, Pinot Gris and Pinot Meunier while from Traminer we get Red Traminer and Gewürztraminer. The two most well known mutations in the Manseng family are Petit Manseng and Gros Manseng. The two grapes are nearly identical except that the Gros Manseng has larger individual berries and larger berry clusters than the Petit Manseng. Gros Manseng is the more widely grown of the two grapes, covering about 2,000 hectares in Southwest France to Petit Manseng's 600, but Petit Manseng is considered to be the higher quality cultivar. The plantings of Gros Manseng are so high precisely because the vines have larger berries and larger berry clusters, which means that per vine, you can get more juice from a Gros Manseng plant than you can from a Petit Manseng plant. Both grapes have fairly thick skins which means that they must be carefully handled in the winery to ensure that excessive tannins are not extracted during the pressing process. The rule of thumb with the two vines is that dry table wines tend to be made from the Gros Manseng plants while sweet dessert wines are made from the Petit Manseng. Like every rule, this one has its exceptions, but it's a trend that you can reliably bank on most of the time. In the Jurançon, located about 30 km from the Spanish border, the production of dry white table wines from any member of the Manseng family is a relatively recent phenomenon. The region was granted AOC status in 1936, but only for sweet wines since dry Jurançon (known as Jurançon Sec) didn't really exist at the time. It was only in the 1960's and 70's when consumers began to turn away from sweet wines to dry table wines that winemakers in the Jurançon began to make the change. Some producers still feel that dry Jurançon wine is a bit of an abomination, but others were happy to see the change come. Sweet wine production is very time and labor intensive and is much more subject to nature's whims for its production. Dry wines are more reliable and since they don't take as long to make and mature, the merchants can turn them around faster and get some extra capital to make sure the lights stay on. Despite the naysayers, Jurançon Sec was given AOC status in 1975. The first wine that I was able to try was the 2007 "Chant des Vignes" Jurançon Sec from Domaine Cauhapé made with 100% Gros Manseng grapes. The bottle set me back about $25. The Domaine was originally purchased in the early 1980's by Henri Ramonteu. At the time it consisted of 4 hectares of overgrown land planted mostly to hybirds with a few 90 year old Gros Manseng vines sprinkled in. Ramonteu kept the Manseng vines and pulled up everything else. He eventually expanded the Domaine to include over 40 hectares of land, making him the largest producer in Jurançon. The grapes for the Chants des Vignes are picked in early September before they are fully ripe. In the glass, the wine was a medium gold color. The nose was nicely aromatic with apricot stone fruit, orange peel and flowers. On the palate, the wine was medium bodied with fairly high acidity. There were flavors of grapefruit peel, apricot, pink grapefruit, honeysuckle flower, honey and lemon with a bitter, pithy note on the finish. The flavors were explosively dense and layered while still maintaining excellent balance. I was initially worried this may be past its prime, but it was strongly kicking and was a pleasure to drink. The second wine I tried was a late harvest wine made from a blend of Gros Manseng and Petit Manseng. It's bottled by Chamarré, which it looks like is a kind of umbrella company that makes wines all over France. Whatever the case is, this 2003 bottling set me back about $16. I suspect that the blend is mostly Petit Manseng, but can't find any solid numbers to back that up. In the glass, the wine was a deep gold color tending to amber. The nose was nicely aromatic with rich tropical fruits like pineapple and shaved coconut with honey and pear aromas as well. On the palate the wine was full bodied with medium acidity and medium sweetness. The palate followed the nose pretty closely with pineapple, coconut, very ripe pear, honey and honeysuckle flower. For the money, it was a very nice sweet wine, though it definitely lacked the complexity and denseness of botrytis-affected or ice wines. The coconut was so strong it almost had a kind of tropical fruit candy kind of taste to it that I imagine you'll like or dislike in proportion to your tolerance for that kind of flavor. This wine probably doesn't have a lot of time left in the bottle so if you have one hanging around in your cellar, now's the time to pull the cork on it because it probably won't get any better from here on out. It's tough to grow grapes in the northern United States. The winters can be brutal and nearly all of the grapes used for wine production in Europe are unable to stand the intense cold. When you also consider the fact that the growing season is much shorter in these areas due to their cooler springs and autumns, you may start to wonder why anyone would even bother. Apparently the desire to grow grapes and make wine is strong one, and many research universities in northern states have programs dedicated to exploring viticulture within their borders. Places like the University of Minnesota have been extremely important in the development of cold hardy grape species that can survive the harsh conditions of the upper mid-west. There are also passionate amateurs who have always been at the forefront of viticultural innovation in these borderline climactic zones. Elmer Swenson became interested in grape breeding after reading Foundations of American Culture by T.V. Munson. He owned a 120 acre farm outside of Osceola, Wisconsin, where he started his own vineyard laboratory in 1943. He started with fifteen hybrid cuttings and began to experiment by crossing them with native vitis riparia grapes. In 1969, the University of Minnesota approached Elmer about a job opening as a senior plot manager, and he accepted. His official responsibilities were focused on caring for the university's plantings of apples, blueberries and raspberries, but he was able to find some space on campus to carry on his grape crossing experiments. In his own words, "they didn't say no and they had room, so I muscled in there." Despite the bench space he commandeered at the University, most of his grape hybridizing was still done at his Wisconsin farm. In 1981, Swenson introduced St. Croix, and he was awarded a patent for the grape in 1982. The grape is considered to be somewhere between moderately and very cold hardy, as it is able to survive temperatures ranging from -20F to nearly -40F with no apparent injury to the plant. The grape is also prized for its lack of native labrusca flavors when vinified. It has some problems, though. It does not attain a particularly high level of sugar when fully ripe and can also lack tannins. The skins are very thin and the grape is susceptible to many fungal infections as a result. Also, the skins can have a tendency to rupture on the vine, leaking juice out of the berries. Despite the thin skins, the wines can be very darkly colored, as the juice itself tends to a light pink color. Many of these shortcomings are addressed by blending St. Croix with other grapes to create a more balanced wine, but there are some places who are making varietal St. Croix wines. One of them is Bully Hill Vineyards in the Finger Lakes region of New York. Hockey fans in the northeastern US may recognize the name: Bully Hill has advertisements on the boards of several hockey arenas throughout the northeast. The winery has a long, colorful history that interested parties can read all about here. It's heavy on family drama and lawsuits and that kind of thing, so read on if you're into that gossipy stuff. What is more interesting to the matter at hand is that Walter Taylor (the central figure of the Bully Hill saga) was one of the earlier growers in the Finger Lakes to make the move from native grape varieties to hybrid grapes in the 1950's. He was kind of obnoxious about it and became a polarizing figure as a result. Hybrid grapes are still the bread and butter of Bully Hill, though whether that's still such a good thing is open to debate. I visited Bully Hill in July of 2011 against the advice of several people who were knowledgeable about the area for a few reasons. The most important reason was that I had the spare time to do it and happened to be just down the street from the winery one afternoon. I was also curious about many of the hybrids that they offered and was just curious about the place in general. My overall impressions weren't very favorable. While waiting around for the group ahead of us to finish their tasting, we were able to overhear parts of the pourer's banter and it was tough to listen to. I don't know if the guy was a racist or not, but he was saying some pretty racist things. My wife and I skipped the guided tasting after that and went straight into their showroom where they offered samples of any of their 40 something wines for $1 a pour. The biggest problem with many of the Bully Hill offerings is that they are very sweet and, often, sloppily made. Retail on many of their bottles is around $8 and, frankly, their commitment to hitting that bottom line shows more than any commitment to quality they may have. Their portfolio isn't 100% junk, though, as I discovered when I tasted their St. Croix bottling. I picked up a bottle of their 2009 St. Croix for $8 on my visit. They call this a "special reserve," but the term doesn't seem to mean anything as it's the only St. Croix they offer. In the glass, the wine was a deep, inky purple-black color with a very thin violet rim. The nose was nicely aromatic with black cherry, blackcurrant and plummy black fruit with a touch of smoky spice to it. On the palate, the wine was dry and on the fuller side of medium with fairly high acidity and low tannins. There were flavors of black plum, tart blackberry, sour cherry and cranberry with a touch of smokiness. The wine was very tart, but that was the only serious problem I had with it and overall I was fairly impressed. The wine had a soft, easy drinking kind of texture and was somewhat reminiscent of a cool climate Cabernet Sauvignon. I sampled through a few of the winery's offerings when I was there, and this was hands down the best thing that I tried. It's not a world class wine by any stretch of the imagination but at $8, it's enjoyable enough. The southwest of France is perhaps its most consistently overlooked region. It is common to go into a wine shop and find bottles from Bordeaux, Burgundy, Champagne, Rhone Valley, Alsace or the Loire Valley with little trouble. Languedoc-Roussillon is showing up on more and more shelves and wines from the Jura and Savoie have been a staple in geekier wine shops for many years. But outside of a few isolated outposts (notably Cahors and Madiran), Southwest France goes largely ignored by most wine consumers, which is too bad because there are a lot of exciting grapes being grown there that either aren't grown anywhere else on earth or are grown in very limited quantities elsewhere. The price is right for most of these wines as well, since the region's low profile means there isn't a large worldwide demand for its wines. Many of the best examples can be had for extraordinarily low prices. In short, Southwest France is a great place to go hunting for unusual bargains. Geographically, the region broadly defined as Southwestern France is located just south of Bordeaux and stretches south towards the Spanish border. It is bounded to the west and east by the Bay of Biscay and the Mediterranean Sea, respectively. Though it is located very close to the sea, there was no major seaport in Southwestern France, so the growers and vignerons had to ship their wines north to the port at Bordeaux. The problem was that the merchants in Bordeaux had their own wines to sell and enacted a series of policies that was designed to squelch any competition from other regions. Since the people of Southwest France didn't really have any other options for shipping their wines, they were at the mercy of the Bordeaux merchants for centuries and struggled to establish a reputation for their wines abroad. In 1189, Pope Alexander III decreed that a town called Saint Jacques de Compostelle (today known as Santiago de Compostela) located in the far northwestern corner of Spain was a Holy City. Holy Cities were a big deal back then, and a huge number of people began making pilgrimages to the site. Since nobody was flying around in airplanes and the sea route wasn't practical (nautically or financially), everybody making the pilgrimage ended up passing through Southwest France on their way to the Holy City in Spain. Foot traffic equals economic opportunity and many of the villages that exist in Southwest France today were set up as way-stations for pilgrims coming to or from Santiago. It is thought that many of the unique grapes grown in Southwest France today arrived via some of these pilgrims, most likely those on their way home from Spain. One of the more interesting grapes from this region is called Fer Servadou. Those of you who are up on your Latin will recognize that Fer looks a lot like the Latin word for iron (ferrum). The grape is so named not because the grapes or leaves have a rusty color to them, but rather because the wood for this vine is extraordinarily hard. Fer has a number of synonyms, the most common of which are Mansois (used primarily around Marcillac) and Braucol (used primarily around Gaillac). It is grown throughout Southwestern France where it is often used as a blending grape. It has long been a key component in Madiran where it is used to soften the harsh edges of Tannat and provide color and aroma, though it is being supplanted by members of the Cabernet family. Fer is perhaps most important in the Marcillac region, located just northeast of Cahors in the northeastern part of Southwest France. The vineyard areas of Marcillac are located in the valleys of two streams that run through the area, the Ady and Créneau. The earth here is rich in iron oxide, and, as a result, the soil and rocks in the area are a distinctive red color. Wine has been made here since at least the Middle Ages, though it took a serious hit when phylloxera struck. The vineyards were completely wiped out during the infestation and were only saved, somewhat ironically I suppose, by the discovery of coal in the area in the mid-1800's. The coal mines produced a lot of thirsty workers so many of the old vineyards were grafted and re-planted to slake the local workforce. The mines were closed in 1962, and plantings in the area dropped again, but a few producers banded together to create a cooperative. The move helped them obtain VDQS status in 1966 and full AOC recognition in 1990. There are a scant 180 hectares under vine in Marcillac, and nearly all of it is devoted to Fer. I was able to find a bottle of the 2010 Domaine Du Cros "Lo Sang del Païs," which means "blood of the countryside." I picked it up from my friends at The Wine Bottega for about $15. Domaine Du Cros is owned by Philippe Teulier. Philippe's father got started in 1982 with a single hectare under vine. Today, Philippe farms 25 hectares in total, making him the largest independent grower in Marcillac. All the grapes on his estate are hand picked and the winery is built into the steep hillsides of the region in order to take advantage of gravity during the winemaking process. The "Lo Sang del Païs" bottling is his entry level wine made from the youngest vines on the estate (and representing about 2/3 of his production). The wine is fermented in temperature controlled stainless steel before undergoing malolactic fermentation in large neutral oak foudres. In the glass, the wine was a deep, inky purple-ruby color. The nose was nicely aromatic with boysenberry, sweet black cherry, fig and spice. On the palate the wine was medium bodied with fairly high acidity and fairly high tannins. There were tart cherry, blackberry and wild raspberry fruits with some cranberry and leather. It was a bit of a surprise to get so much sappy black and purple fruit on the nose but tart, red berry fruit on the palate. Overall, the wine was a little sour and a little thin. Gaillac is located just southwest of Marcillac, right outside the town of Toulouse. Archaeological evidence has shown that the vineyards in Gaillac were already in full swing by the first century AD, though they likely go back a few centuries before that. Through the years, Gaillac has had their share of boom and bust times, through barbarian invasions, church occupation and their on-again/off-again trade relationship with England. Today, Gaillac is the second largest area of the Southwest in terms of volume of production, and the wines come in all kinds of different styles. Sparkling wine is especially important here, and has a history that pre-dates Champagne production by at least 100 years. The method used is similar to the méthode ancestrale used in Limoux, and is known locally as the méthode gaillacoise (though the AOC laws stipulate that it must be labeled as méthode traditionnelle). There is also something called gaillac nouveau that is made from Gamay grapes vinified in the same way as the more famous Beaujolais Nouveau. Fer is important in Gaillac, but not to the extent that it is in Marcillac, though it is required by law that the local growers' AOC plantings be comprised of at least 10% Fer in Gaillac. Domaine Philémon is located near the Vere river in the northeastern part of Gaillac. I'm not sure what percentage of Fer Domaine Philémon has planted, since it doesn't look like they have a website, but what I do know is that the Vieules family (who owns the estate) has farmed this region since the early 1800's and farm wheat, sunflowers and grapes in equal measure. I can only find mention of two wines that they produce: the "Perle," which is a white blend of Mauzac, Len de l'el and Sauvignon Blanc, and the "Croix d'Azal," which is 100% Fer, though they use the local term Braucol. I was able to pick up a bottle of the 2009 Croix d'Azal from my friends at The Wine Bottega for about $13. I believe Curtis Liquors in Weymouth and the Spirited Gourmet in Belmont also carry this wine. In the glass, the wine had a deep, inky purple-black color with a very narrow violet rim. The nose was nicely aromatic with crushed blackberry and black cherry fruit with a little smoke, licorice and wet leather. On the palate the wine was on the fuller side of medium with fairly high acidity and fairly high tannins. There were dark, black flavors with blackberry and black cherry fruit, charcoal and smoke, black pepper (which was especially strong on the finish) and a funky leathery kind of taste. This wine was much more rustic than the Marcillac, but was also deeper and more complex. It was also much more balanced and well-structured and I had to check the price tag a few times to make sure it was really only $13. This wine is an extraordinary value and would be fantastic on any food with a smoky char to it. If you're a fan of backwards, rustic Rhone style reds, seek this wine out. I should mention that most of the information for this post is from Paul Strang's South-West France: The Wines and Winemakers, an indispensable historical resource as well as an interesting guide to the producers of the region. People interested in learning more about Southwest France would be well advised to pick up a copy of this book. Let's go ahead and get this out of the way: yes, Marzemino was mentioned in Mozart's opera Don Giovanni. Just before being sent to Hell, Don Giovanni says, "Versa il vino! Eccellente Marzemino!" Which means something like, "Pour the wine! Excellent Marzemino!" Every single source that has anything to say about the grape relates that little vignette (including the blurb on the back of today's bottle), so in that grand tradition, there you go. You have to wonder about a wine who's major claim to fame is a throwaway line in a 300 year old opera. Marzemino is certainly not held in that kind of esteem these days, as the most enthusiasm that The Oxford Companion to Wine can muster is to call the grape "interesting," while Nicolas Belfrage (in his Barolo to Valpolicella), in a colossal feat of back-handed complimenting, says "there is no producer today, as far as I am aware, whose wine may be described as 'eccellente,' but then even a hamburger might be delicious if your next stop is Hell." I happen to think that hamburgers are delicious in all sorts of circumstances, so I was very curious to check out Marzemino for myself. Marzemino is a fairly old grape, known in northeastern Italy since at least the 16th Century. It is thought to be native to this area, but solid evidence was lacking until recently (there's an alternate theory that it may originally be from around the Marzemin village in Austria, but I can't find any corroboration for that). DNA testing has shown that Marzemino has a parent-offspring relationship with both Teroldego and Refosco dal Pedunculo Rosso, both of which are indigenous to northeastern Italy. It is also a full sibling of Lagrein, meaning that both grapes share the same set of parents. In my Refosco post, I was confused about the exact nature of the Marzemino-Refosco relationship, but a family tree on this page was most helpful in sorting that out. What's going on is that Teroldego and an unidentified grape are the parents of both Marzemino and Lagrein, while Marzemino and another unidentified grape are the parents of Refosco. 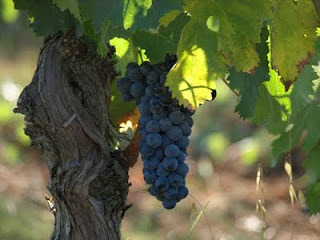 Marzemino can be a high yielding vine, which may explain why it is still around despite its many problems in the vineyard. It ripens late, which can be an issue in the some of the cooler areas of northeastern Italy (and which may explain the high occurrence of grassy and herbaceous notes that litter many descriptions of wines made from the grape). It is also highly susceptible to a large number of fungal diseases which can make it a challenge to grow in wetter regions. Yield control and proper planting are needed to produce quality wines from the grape since, as mentioned above, it can yield very large crops and suffers badly if planted at very high densities. All of this adds up to a very high maintenance vine for quality production. As Mozart's mention of the grape indicates, there was a time when Marzemino was rather in fashion. It was a big deal in Austria for awhile, and still enjoys a certain popularity there to this day, but on the whole, Marzemino's star has fallen in more recent centuries and the grape has become more of a local phenomenon than an international player. These days, most Marzemino is grown in the Trentino region of Italy, though there are also plantings in Lombardia, Friulia and the Veneto. There may well be plantings in other countries, but you'd be hard pressed to find a varietal Marzemino outside of northern Italy. I was able to pick up a bottle of the 2009 Costaripa "Mazane" Marzemino for about $20 from my friends at Curtis Liquors. The wine is from the Garda DOC (named for Lake Garda) which straddles both the Veneto and Lombardia, but this estate is located in Brescia, which I believe is on the Lombardy side of the border. All the grapes for this wine come from a single vineyard on the hillsides bordering Lake Garda. The yields are kept low and the wine sees very little oak with most of it fermented and matured in stainless steel. In the glass, the wine had a medium ruby color. The nose was medium intensity with red cherry, strawberry and stewed raspberry fruit aromas. On the palate the wine was medium bodied with fairly high acidity and medium tannins. There were flavors of sour cherry and wild strawberry fruit with a touch of leather and a little funk on the finish. If someone asked you to describe a typical Italian food wine, you'd probably come up with something that very closely resembled this. The fruit flavors here are straightforward without being Kool-Aid simple and there's just enough tannic grip and acidic bite to complement a wide variety of foods, but especially tomato sauce based foods. You can drink this on its own, but you'll get so much more out of it with something on your plate. It's definitely not the kind of bottle that I'd reach for before being sent to my ultimate demise, but it's nice and is especially worth checking out for Chianti fans.